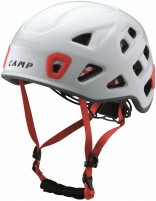 One of the lightest and most ventilated helmets in the world, the CAMP Speed helmet is quickly becoming a popular fashion accessory on the skimo race circuit. This should not be surprising as the helmet is designed for competitive ski mountaineering (and climbing) and weighs just 263 grams (9.3 oz). With a fully EN-certified in-mold construction, the adjustable Speed helmet will protect your noggin from a floggin' if you decide to point it down some breakable crust in a mad dash towards the finish line. Twenty-two (22) streamlined vent holes help keep you cool at race pace. Clips on the front and rear accept goggles or a headlamp. No vents in front to stop the wind and prevent moist air from entering raised goggles. Fully EN 12492 certified at a very low weight. Simple dial adjustment system on the back and adjustable chin strap give a comfortable fit. Version 2.0! - The new version of the classic Speed Helmet is the same mold with cooler colors and a full polycarbonate shell for a little extra durability. I have one of these helmets and it only has headlamp clips on the front. My friend has the same one but a different color and it has headlamp clips on the front and near the rear. Are there two versions. I wish I had all 4 clips. Seth- I am not sure of the answer. Your buddy might have the 1.0 version which looked very similar. That may have been the difference between the 2 helmets. That helmet is no longer available so I cannot check for you. Hi Seth, both versions of this helmet have the one clip in the rear, as you can see in the orange photo. I borrowed a Camp 2.0 helmet for the Grand Traverse. When I was adjusting the helmet before the race for my head size, I realized that either myself or someone previous that was wearing the helmet popped the two plastic rivet fasteners located on either side of the helmet to keep the headband in place. I need a rivet placement kit/instructions to repair before I return it to the owner. Can you help? Hi Dan, the best bet is to send this in for a warranty exchange. I'll send you the info. Hi Karl, we'll contact you to get this fixed. Overall: Five Stars for a certified climbing helmet that is deservedly popular for skimo, even among lots of newer competition. Background on product familiarity: I bought my Speed helmet in Spring 2009, and wore it almost exclusively for about four years. Over these past two seasons, I’ve mainly used some lighter competition. But I still use the Speed for training and some shorter tours. First, the first impressions out of the box: If you’ve previously worn only heavy ski helmets or traditional hard-shell climbing helmets, you’ll be astonished at the lack of weight. And the adjustment dial in the back is simple and effective, allowing the helmet to fit a wide range of head sizes and shapes. The weight distribution is somewhat unbalanced, biased up on the top. However, the helmet has so little weight that this imbalance is also somewhat moot. Second impressions, in use: The vents are ample, but the design is of course far hotter on the ascent than bike helmet designs that are more vent than helmet. However, with the vents all on the side and back, the Speed won’t give you an ice cream headache on the descent. Third impressions, for long-term durability: All of these expanded foam bicycle-style helmets are essentially one-hit wonders, designed to sacrifice their lives for you. That said, mine is still in fine shape on the outside despite some clanging around on the pack of my pack during long late-spring and summer approaches. And the inner foam, etc. has also held up well. This is great lightweight, well ventilated helmet. I primarily use my helmet in the spring time, often times skinning in it all day long, to avoid ice and rock fall. In regard to that it's awesome and light, you barley notice it on your head, breathes well, so you don't over heat as bad as some other helmets I have used. The retention system is the one flaw, I wish it would tighten a little better, if you wearing a hat under the helmet it doesn't seem to lock down very well, and seems to bounce around when skiing. If it's just your head and the helmet, works great!! I have skied it with goggles and seems to work just fine. Not the best, but more then adequate. 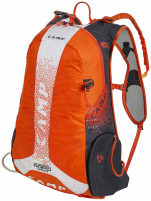 Nice and lightweight, so even when your pack is loaded down for hut trips, or spring days with lots of metal, this adds very little weight. I bought this helmet because it was the lightest I could find. In that regard it's a five star item. I've had it for 3 years and having less weight on your head can really make a difference on long days. I do struggle getting my headlamp to stay put sometime (zip ties as needed). They don't fit my goggles as well as my down hill helmet does, but I didn't buy it for the looks, and I use glasses the vast majority of the time. I have noticed a couple of dents in the shell not from rock or ice fall but just from rough handling (throwing in the back of my car still attached to my pack). I've been much more careful about that since. Overall, it is light and the other shortcomings are well worth it. The light weight of the CAMP Speed helmet is great! I don't like a heavy helmet on my head because I'm not used to throwing that weight around; it makes me feel slightly awkward. For the weight, I'm impressed with how much coverage is available above the ears and over the back of the head. I use this helmet all the time for skiing. The chin strap is padded with soft, plush material, making it comfortable. The screw know tightener in the back is seamless and easy to use with gloves on. It takes a minute to seat one's headlamp strap into the headlamp guides, but once there, the headlamp isn't coming off. I usually wear this helmet with a hat to fend off the cold. It's got a ton of vent holes, so heat buildup hasn't been a noticeable issue. On the rare occasions I've used this helmet with goggles, I simply place the goggles halfway up the front - so the front of the helmet is centered between the top and bottom foam of the goggles - and they stay in place just fine. These are the problem areas of this helmet that I've noticed. 1) It's hard to unbuckle the chin strap while wearing gloves. 2) The helmet seems to ride high on my head, which creates some gaper gap, mostly because I'm usually wearing sunglasses. 3) The plastic outer shell is very thin; so this isn't my helmet of choice anytime I expect to be in a zone with a lot of falling rock projectiles. There, I'll wear a different helmet with a hard, thick, plastic outer shell. 4) For some reason, it's hard if not impossible to adjust the chinstrap while actually wearing the helmet. I have to remove it to adjust it, because pulling hard on the strap while wearing the helmet doesn't do the trick. These are minor, or easily worked around points, IMHO. Camp USA is great about offering demos of their equipment at numerous COSMIC skimo races throughout Colorado. For this reason I've ended up using this helmet in races on about eight occasions. I do usually take the demo helmet over my bike helmet, but then an hour or so into the race I kind of wonder why I do so. There is nothing special about this helmet other than it's lighter than most other helmets you'll find. If that's the selling point, score one for Camp. That said, if this is supposed to be a skimo-specific race helmet, I'm not sure where the specificity comes into play. This helmet does a bad job of holding goggles in place. If you're wearing goggles on your face it works fine, but if you want to put them up in case you need them later, I've almost always had to use duct tape or zip-ties to keep the goggles attached. One advantage this helmet has over a traditional bike helmet is that it doesn't have front vent holes. This is key because holes up front on a ski helmet are nothing more than a google fogging nightmare. Your head sweats and then ices up your googles on the inside. Duct tape is again an easy solution to this problem when using a bike helmet, so for the price I don't think this helmet is worth your money. 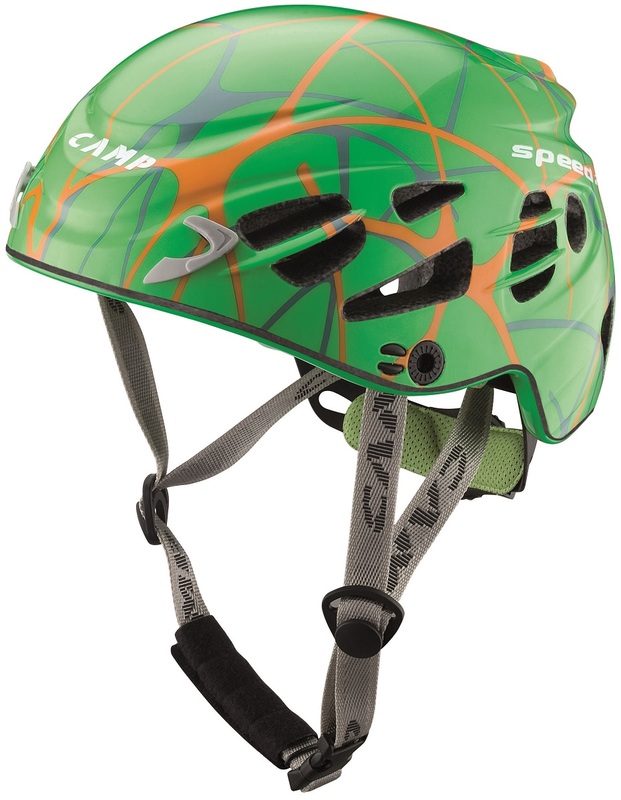 All of this said, there are a number of CAMP sponsored athletes (mainly Team Crested Butte) that have access to an attachable visor for this helmet, which I'm sure solves all of these problems and does make this a full-blown skimo specific helmet. When these visors become available via retail here in the USA this helmet will be great. (I don't know if the Trab visor for their helmet is compatible...if so, maybe that's the solution.) Until then, I'd recommend you save your money. Without an attached visor, this is nothing more than a bike helmet impersonating what should be a skimo helmet. Used for rock climbing this helmet should be great. Thanks for the feedback Jeremy. I looked into the visor and found that it is not a CAMP product, just an adaptation of some other visor. Regarding bike helmets, I also used one of those for my first few races. The major safety difference is of course the certifications, with the Speed being UIAA certified for rockfall and thus more appropriate for ski mountaineering (or climbing).